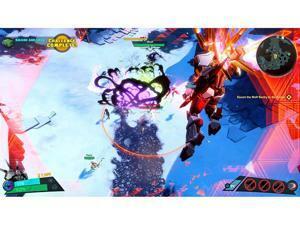 On paper, there are a lot of elements within Battleborn worth getting excited about. 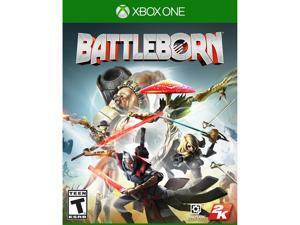 The game features an expansive, well-rounded roster of 25 different characters (with more to come via DLC), it has co-op and competitive elements which are equally meaty, it sports a unique visual style which marries cell-shaded graphics with bright aesthetics, and it was developed by Gearbox Software, the same studio behind the beloved Borderlands franchise. However, Gearbox’s efforts to weave the MOBA and shooter genres together into a cohesive package sadly didn’t come together as well as I would have hoped. While Battleborn can be fun in short spurts or when you’re rolling with a skilled team, only the most diehard Gearbox loyalists will find any sort of long-lasting appeal. While Battleborn does technically have a story, it really only exists as an excuse to justify the inclusion of a story campaign which doubles as the game’s co-op component. All you really need to know is that the game’s various factions are fighting for control of the galaxy’s last remaining star, Solus, though they eventually band together to defeat the evil Varelsi faction (since it wouldn’t be much of a story campaign if there wasn’t a main antagonist). The conflict between the factions also means there’s a competitive component as well, with one of the three different competitive modes serving as a slightly tweaked version of the typical MOBA setup (players take out enemy minions and guard their own minions to destroy a larger objective in the enemy base). Overall, Battleborn is actually pretty solid from a gameplay perspective. The shooting mechanics feel good, the robust roster means there’s at least one character who should appeal to you no matter your preferred playstyle, and there’s also plenty of in-game challenges and unlocks to keep dedicated completionists busy (character skins, titles, taunts, talent mutations, stat-altering gear, etc.). Even with such solid gameplay, though, the amount of mileage you’re able to get out of Battleborn will be drastically affected by the type of gameplay you’re looking for, and to what degree you’re willing to put up with the game’s shortcomings. Even though the game’s prologue mission may try to trick you into thinking Battleborn is a solo-viable game, make no mistake, it isn’t. Every one of Battleborn’s story missions is quite a lengthy affair, with an average completion time of 35-50 minutes (assuming you manage to actually complete the mission, of course). The problem is that most of that length is artificial padding, forcing you to slog through throngs of enemies, or defend a stationary objective from waves of encroaching foes. As you might imagine, this slog quickly reaches unbearable levels if you attempt the story missions solo. When playing co-op, the fact that you only have a limited number of lives is a minor annoyance, when playing solo, it’s actually a welcome mercy, since without them, you’d likely spend hours just trying to complete a single mission. The plodding nature of each story mission is less noticeable when playing co-op, but making it so that failing an objective at any point during a mission results in failing the entire mission, even when you have spare lives, was a bizarrely poor choice on Gearbox’s part, since failing a mission after investing 30+ minutes into it not because your team gets wiped, but because your teammates weren’t concentrating on defending an objective is incredibly demoralizing. In short, if you’re planning on investing in Battleborn’s story mode, stick to co-op, and try to recruit some competent friends if you have any. I never thought I’d say this, but I actually enjoyed Battleborn’s versus mode more than the co-op story campaign. Obviously it never feels good to lose, but the myriad of different unlockables mentioned earlier combined with the game’s three distinct competitive modes helped to keep me motivated even when I was on a bit of a losing streak. If you’re looking for something akin to the “classic” MOBA experience, you’ll want to check out Incursion mode, in which two teams work to guard friendly minions as they make their way into the enemy base, disabling the shields of two different enemy guardian units and leaving them open to follow-up attacks from the players. Meltdown takes a similar approach, with players having to guard minion waves as they progress towards enemy generators which are located at various points around the map. If you want a mode where you’re not constantly worrying about your minions, Capture has you covered, featuring a more straightforward setup in which each team captures and defends various capture points on the map. Oddly enough, each versus mode has its own set list of maps which don’t cross-pollinate between modes, so if there’s a specific map you take a shine to, here’s hoping you like its associated mode as well. One final point which I feel needs mentioning: I really like how Battleborn’s private versus matches are set up. You can play private matches either with your online friends or with bots to practice, and the game gives you a pretty fair compromise in terms of progression: private versus matches won’t count towards the criteria for completing challenges or unlocking achievements/trophies, but they do still grant XP for both character ranks and your overall profile rank, providing a noticeable incentive for playing a few private matches to warm up before diving into public matches. 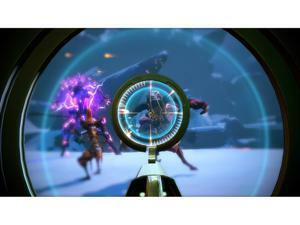 If there’s one thing which will make or break your desire to play Battleborn over the long term, it’s the game’s insistence on throwing its “unique” (read: exactly like Borderlands’) sense of humor right in your face over and over again. I understand there’s likely a large audience for the “edgy” sort of humor that Battleborn was going for, but I personally found it far more grating than witty, especially after hearing each character repeat the same 4-5 lines of pithy dialogue hundreds of times over. Battleborn’s large roster also makes breaking into the game somewhat intimidating, since each character has unique gameplay traits which can take some getting used to if you’re trying to learn how to play as many characters as possible. 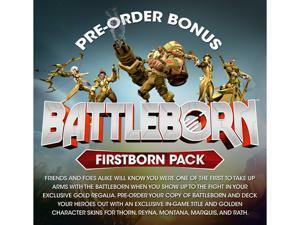 Battleborn smartly uses a system which allows players to unlock new characters via one of two different conditions (either by reaching a certain profile rank or fulfilling other criteria such as beating a specific story mission), so you could technically unlock all of the characters just by playing versus mode, but only the most dedicated players will be able to unlock the entirety of Battleborn’s roster in a reasonable timeframe. Thankfully, the game’s starting roster is pretty well balanced, so there really isn’t any one champion you have to unlock. If you prefer competitive multiplayer over co-op and you don’t mind working a bit to unlock some of its more coveted rewards such as new characters and character skins, Battleborn could be just the MOBA-esque shooter experience you’re looking for. Even if you’re more of a co-op fan, there is some fun to be had in Battleborn, at least as long as you don’t try to play the game’s story missions solo and you’re playing with competent teammates (if you insist on going in lone wolf, I’d personally recommend leveling up your favorite characters in private versus matches a bit in order to unlock new mutations before attempting the solo story missions). In many ways, Battleborn feels like a spiritual successor to the Borderlands franchise, something which I feel will ultimately decide how much you enjoy the game just as much as its gameplay elements. 7.25 While Battleborn didn’t gel as well with my gaming sensibilities as much as I’d hoped it would, even I can’t deny that the game has a lot to offer to the right sort of gamer. If you’re itching for a new Borderlands-esque experience which is all but guaranteed to keep you occupied over the long term, Battleborn will certainly scratch that itch. If, however, you never cared for the Borderlands style of humor, and you’re more of a solo-minded gamer, you might want to look elsewhere for your next shooter fix. Battleborn’s bright, colorful visuals are sure to draw you in, but in the heat of battle, everything just seems to smash together haphazardly, putting unnecessary strain on the eyes. Moving around and fighting feels solid, though constantly readjusting to the unique combat styles and abilities of different characters can take some getting used to. The story is very forgettable, rife with characters who made me roll my eyes on more than one occasion with their attempts at “edgy” humor, though I do have to acknowledge Gearbox’s efforts to give a clear direction to the game’s narrative. If you don’t mind putting up with Battleborn’s so-adult-it-hurts brand of humor, there’s a surprisingly deep amount of variety within the game’s versus mode, and even the story missions are fun on occasion (at least as long as you’re playing co-op). There’s also a ton of unlockable rewards to earn and challenges to complete, ensuring there’s always a new goal for dedicated players to work towards.